Coat and eyes Hatsune has a black coat which is pretty dark and a very small grey tailtip. The inside of his ears and his paw pats are a lighter color, more a very dark grey. His nose is also grey, but lighter grey than his paw pats and the inside of his ears. His coat is very short. Hatsune’s eyes are a green color, the same color as the green font color used here. There are slight hints of yellow in his green eyes, but barely visible. Build: Hatsune has a sleek body which is made for running. He’s the size of an adult female wolf, so a lot smaller than his fellow male wolves. Due his sleek and small body, he barely has any muscles underneath his skin, making it look like he has a really thin body with sleek long legs and a longer neck than most wolves. A rather big wolf could fit twice his body size, roughly estimated. His ears are also a bit more sharp than those of other wolves around him, same goes for his muzzle which looks rather longish and small. 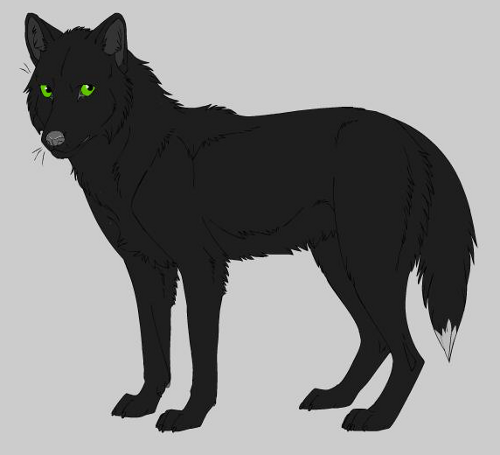 Hatsune is a steppe wolf with a black coat, but has the body size of a small European/Eurasian wolf, so they often mistake him for being an European/Eurasian wolf. 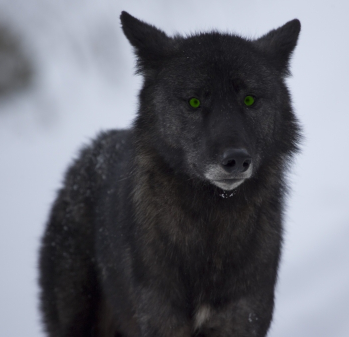 Personality: The male is very shy and often scared of other wolves. 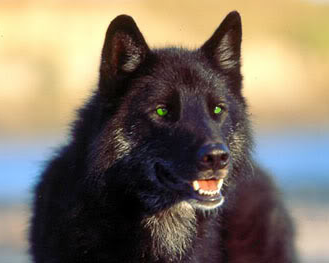 Even though other wolves don’t mean it that way, he can often get startled by someone and their sudden movements. Hatsune also can get scared by sudden sounds or movements in bushes, but this always happens when he hasn’t smelled anything close by that could produce that sound or movement. Hatsune doesn’t talk much and he doesn’t even dare to speak. He only speaks when someone higher in ranks asks him to. He always stays somewhere near his pack, but never really comes closer than two to three meters of length. Hatsune is a coward and always brings himself down by saying he’s not good enough for anything. Wherever he goes, whatever wolf he meets, he will always be the silent, scared wolf with the ears pushed back and the tail tucked between its legs, always being submissive towards others. When danger is nearby, Hatsune will surely flee and not look back, his tail always between his legs and his body curled into an odd position that holds more than fear. He prefers to have others around him who can protect him because he hates to fight, but he will never come or stay too close near someone, always sleeping alone somewhere at the edge of the territory or wherever, always on his very own, talking to himself. When he’s alone, he does that often, but when he’s in a pack or around other wolves he only thinks, too scared to talk to himself because he’s afraid to be punished for it. He’s always afraid to be punished for everything he does. Hatsune is a wolf that will do anything for you, whatever you ask him to do, and he will do it quickly and silent. The only thing he can’t do is killing another wolf on command, however. At such moments he just looks away and closes his eyes out of fear and pity. Hatsune isn’t a wolf that warms up to you once you get to know him; he might start talking to you slowly, sometimes even laugh about your jokes, but when gets too loud, he will get scared and correct himself, falling silent again or whimpering and whining and hiding from someone. He cannot be happy and wild around others, even though he wants to. It’s just always that fear of being punished by others for doing something stupid. The male will never feel comfortable around anyone, he has lost that feeling long ago. Body language: Hatsune is often see with his head held low and his ears pushed back against his skull and a very sad/fearful expression. He often holds his tail between his rear legs and walks slowly and carefully, sometimes even in a crouching position. Strengths: Due to his sleek body Hatsune is great at running fast and for long distances even, if he has to flee or really wants to. His small body build can even be used for hiding in small places so that he’s hard to find. Hatsune also has a very strong nose; he can smell very well and can even tell by scents how big a pack is and where they live exactly. He often uses the last strength of his to stay out of another wolf’s territory. Weaknesses: Hatsune isn’t strong at all and is often defeated by other wolves in fights, though, he doesn’t really try to fight them. His shy behavior and his fear of other wolves or big prey is also something that can bring him down or cause other wolves to dislike him a lot. Another weakness of Hatsune is that he can’t tell apart different facial expressions; whenever a dominant wolf is being alert or giving orders to his pack members in a nice way, Hatsune will see it as true dominance and aggression, something he fears a lot. Fears: Hatsune is afraid of dominant wolves and other wolves who are higher in rank than him. He’s afraid of sudden movements made by others and can easily be scared by a sudden movement in the grass and leaves (frog, bird, etc.) or sudden loud sounds (thunder, a yell, a howl, etc.) He’s also afraid of the loud sounds and sudden light flashes from thunder and can get scared by seeing big spiders or insects which he thinks might be poisonous. Likes: Hatsune likes calm and quiet places and a sunny day in which he can relax, being on his own but with other wolves not too far away to protect him if needed, butterflies, beautiful colored flowers. Dislikes: The male hates sudden noises, sudden movements, loud noises, thunder, dominant wolves, wolves that are higher in rank, wolves that like to call him names or use him for their own selfish purposes, being afraid, pouring rain and crossing rivers. Hatsune was born in a pretty big pack, being a pup of the dominant pair’s third litter. 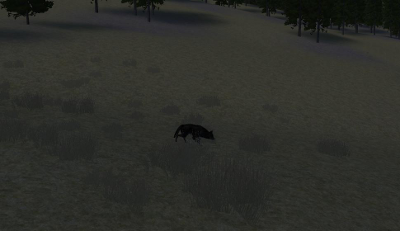 However, all the other pack mates were none of his siblings, but wolves from the outside world. His father had accepted these wolves because they had begged for a good home. Hatsune was the smallest of the litter, the runt, and born last. Due his small body size his parents thought he was a female, so they called him Hatsune, which was a female Japanese name. but soon they found out he was male, however, they decided to keep the name as Hatsune appeared to be quite ‘female-like’ as they called it; he was the smallest and the most shy and silent, not liking to play fight with any of his siblings. That’s why the first three weeks in the den his siblings liked to use him as some sort of prey to hunt down during their plays, or as a weak spot to study their hard words on. Even already by his siblings from the same age Hatsune was nothing but a small weak and fragile wolf-being, prone to bad luck and clumsy behavior and not good enough for any play fights. With play fights he was the target, with hide and seek he was the finder, with hunting games he was the prey. Not that he hated it. He didn’t like it either, but he felt that there was no way for him to go against it all. In the beginning he snapped at his siblings and tried to flee from them, but they always won. So soon enough Hatsune began to give up fighting back. He wasn’t strong enough to beat them, so he decided to let them just use him as their target, getting used to his weak body and mind at already a very young age. Living in a pack full of accepted loners and a not so stable dominant male (his own father), Hatsune learned to live with aggression and anger being thrown at him. His father indeed wasn’t a stable dominant male and so often fights occurred when his father made a slight mistake. There would be battles over who was more dominant than the failing Alpha, and who truly had the right to mate with Hatsune’s mother. Blood would be spilled and wolves would turn against each other, it was a constant shifting hierarchy in the pack. However, Hatsune’s father would always stabilize himself and win in the end, but he never seemed to hold that up for long. When Hatsune was a yearling it was the first time he got to know about the ‘picking-order’. Whenever his father or other wolves were angry or seeking a fight to show their dominance, they would go off to Hatsune and snap at him or bite him, even attack him, always looking to pick on the weakest wolf or the wolf most low in rank. Hatsune hated the feeling of being the lowest in rank, as it was always him who was used as a target to forget one’s anger or hate towards someone else. He knew he couldn’t fight back, so just as with his siblings, he let the wolves taunt him and tease him, scare him to death and make him bleed. Whenever there was a fight between another male and Hatsune’s father over dominance, chaos would spread in the pack, and Hatsune would be the one crushed by other wolves’ paws, like a herd of elk ran over him. He was always tossed around from side to side, used as a target or as some sort of delivery-boy for other’s selfish goods. And he did do nothing about it. Nothing at all. Even when he had caught a little hare to eat, others would steal it from him or chase Hatsune till he would let go of it himself. And Hatsune would never fight back, he would never go against any of these wolves. Females didn’t pay any attention to Hatsune, they found him too weak and too shy, not a good fatherly type for any future pups at all. Always when he tried to talk with other wolves or with these females, they would ignore him and move closer to someone else to chat, like Hatsune wasn’t even there, like he didn’t exist. It hurt his feelings so much that he decided to stay out of everyone’s way unless asked to do something. He would never talk unless someone asked him to. He would do anything for anyone, if ordered. He would be weak, but he would be loyal, that was his motto in life, and he would live up to it. 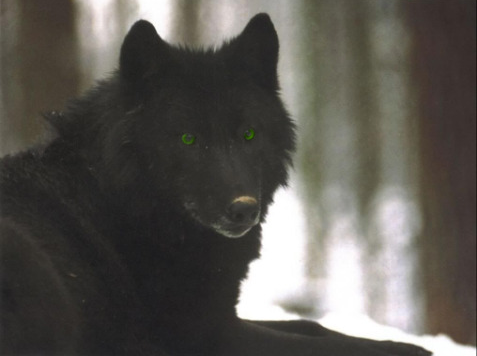 When Hatsune was two years old all his siblings dispersed, looking for a mate and a pack of their own. Hatsune didn’t; he was the only one who stayed behind because he had sworn to be loyal. But this was a great mistake he made. Wolves weren’t allowed to leave the pack unless they were two years old and ready to disperse. Hatsune decided to stay and that was he wasn’t allowed to leave the pack anymore. So after a another month he decided he wanted to get out of there, his father attacked him and told him about the pack’s rules once more; Hatsune would stay for the rest of his life, had been ordered by his own father. Hatsune however didn’t want to live anymore in this horrible nightmare and wanted to wake up, he wanted to get out and have a pack of his own, find a female who cared for him for who he was and not for what they wanted him to be, or for the strength he must have in order to protect a pack. He had always followed orders, but this time was the first in his life that he didn’t listen to his father’s rules. In the middle of the night he woke up and checked on the wolves to see if they were all asleep. When he was sure they were, Hatsune fled from his birth packs’ territory, running as silent as a flying owl during night, his tail tucked between his rear legs and his ears pressed against his skull. He knew he would never be able to be strong and brave as other wolves, but he hoped to find a place where they would accept him for who he was. 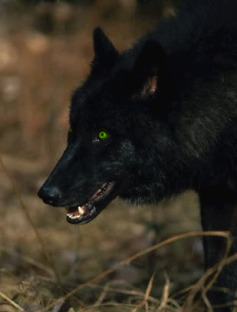 Though, the fear remained within him ever since he got scared of other wolves, and he would have a hard time defending himself or seeing other wolves as friendly and caring, for he had never known a wolf to truly care about him and give him a chance to develop a friendship or a strength that would make him able to trust other wolves. Mate: He doesn’t consider himself a good strong mate to another wolf, so he never had a mate and will probably never have one. Pups: He never had gotten pups, and the fear of losing them because of his stupidity doesn’t make him want any, either. Crush: No one at the moment. Friends: He doesn’t have any friends, no one considers him good enough to be their friend. I like him! I think Kiran and him will be good friends...if Kiran manages to gain his trust x3. Great character, Hatsune!